Military & Wartime Collectibles Auction - Selling a comprehensive offering of wartime military collectibles, to include: Civil War, Indian Wars, World War I / WWI, World War II / WWII, Vietnam & Prior Military Conflicts. Items are consigned from estates, individuals, trusts, lifelong military collections, and private collections across the United States. Online Catalog is posted now and available for absentee / pre-bidding. 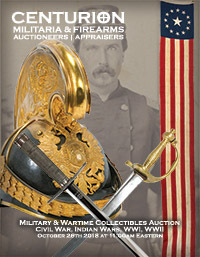 Register and Bid Now on 640 Lots of Military & Wartime Collectibles. Live floor and real-time live online webcast begins at 11am Eastern on Friday October 26th 2018. Auction Day: Lot viewing begins at 10am. List of lots wanting to be viewed must accompany request.